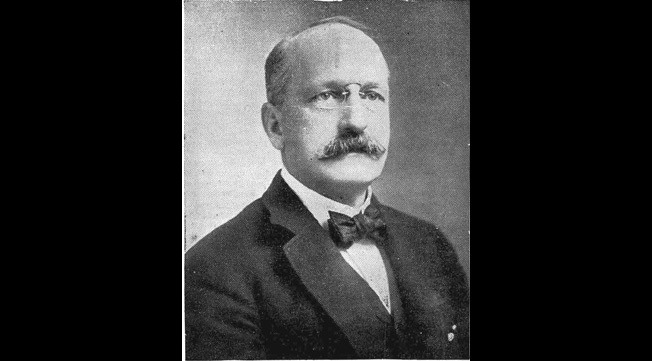 J. Sloat Fassett (1853-1924), President of the Haskell Lumber Company and after 1910 of the Fassett Lumber Company. Map of the rail line lay-out of the Salmon River and Northern Railway. Photograph of one of the steam engines and of one of the steam loaders putting logs in a logging car. One of the lumber shanties of the Fassett Lumber Company around 1913. A skid containing about four million feet of logs on the Fassett Lumber Company limits around 1912. Steam loader and eight logging cars filled with logs and almost ready to go back down to Fassett. On arriving in Fassett, the logging train is parked alongside the mill’s heated log pond. An inclined rollway built on one side of the pond and parallel to the railroad is used to dump the logs in the pond. This photograph offers more precision. The inclined rollway and the sloping railroad tracks make rolling the logs easier. One of the workers is standing on top of a pile of logs that has just slid into the pond. 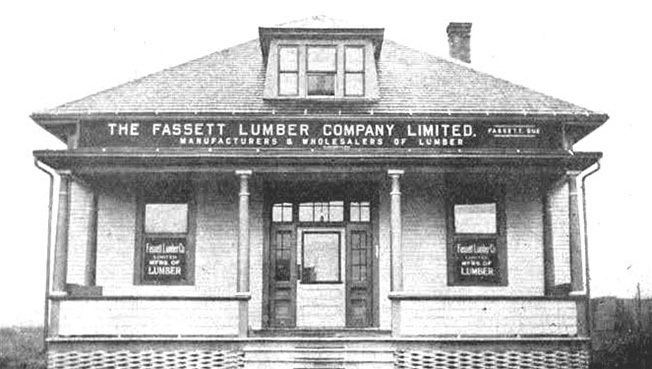 Office of the Fassett Lumber Company, in Fassett, around 1909. The Fassett Company sawmill. 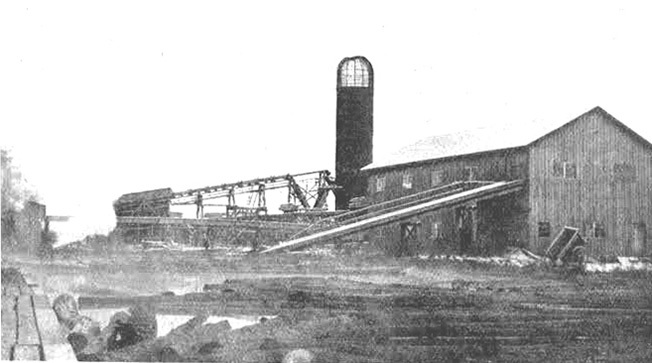 In the background can be seen the mill’s burner, the diameter of which varies from six to nine feet. It is covered with a steel wire-netting grid to prevent the escape of burning cinders. This is where the sawdust and wood residues of the sawmill would normally be burnt. 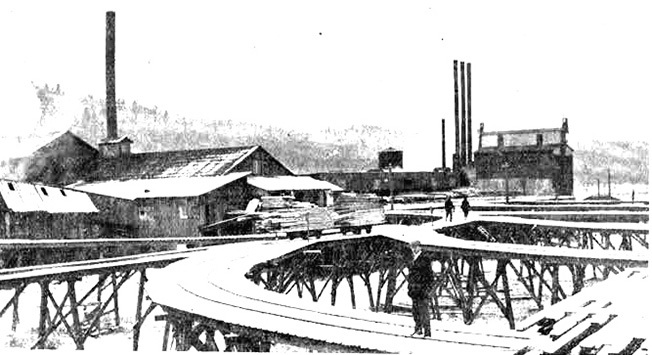 The plant of the Fassett Lumber includes an elaborate system of rails and switches for the elevated tramways that honey-comb the lumber yard, the piling capacity of which is approximately 15 000 000 feet board measure. The saw-wood is hauled by these tramways throughout the piling grounds on the network of ground or over-head rails. Cross-roads of the elevated rails system used to haul the saw-wood to the Fassett Lumber Company lumber yards around 1910. 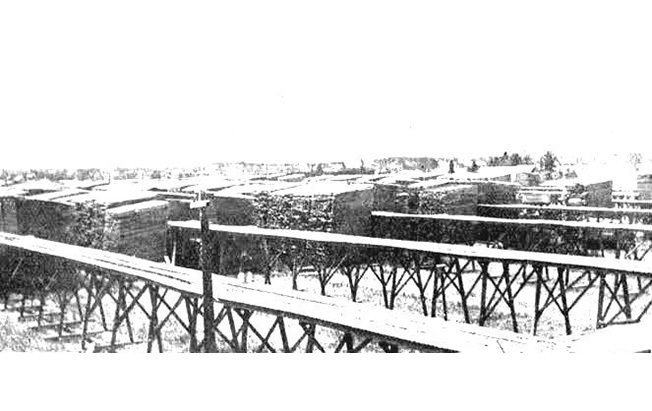 The Fassett Lumber Company piling grounds, showing the elevated tramways around 1910. Aerial photograph taken on October 30th 1927. The old Fassett Lumber Company’s lumber yard can be seen. The railway sidings that used to serve the piling grounds have been lifted. 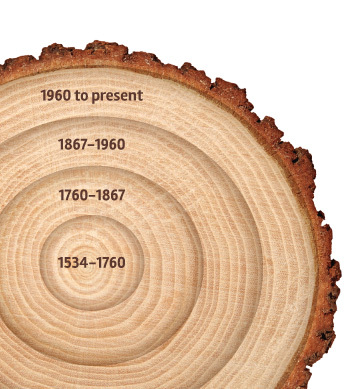 The wood processing and consuming industries and the cities and towns that sustained them were dependent on the availability of the forest resources. 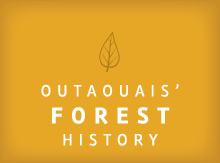 This explains the origin of factories that manufactured wood by-products as well as their disappearance when the forest was unable to supply the wood at competitive prices. . The economic well-being of communities that lived off the forest industry, the one-industry towns especially, hung on by one thread only. The opening of a new factory created jobs, generated economic prosperity and resulted in an increase in population. A closing has the opposite effect! The Village of Fassett, located to the east of the Petite-Nation Seigneury, has lived through the impact of many “bull”1and “bear”2 periods in the forest industry. The rural peace of the east part of the Parish of Notre-Dame-de-Bonsecours fell apart in 1905, when the Haskell Lumber Company Limited, chaired by Jacob Sloat Fassett, established its sawmilling establishment there3. The Haskell mill and the Standard Chemical Company’s factory were built in that area at about the same time. (image) In point of fact, the Standard Chemical decided to set itself up in Fassett after signing an agreement with Haskell Lumber. Haskell agreed to supply hardwood from its timber limits to the Standard Chemical so that she could operate her wood alcohol distillation plant4. The two companies had different needs but drew their wood from the same one hundred square mile forested area which was criss-crossed by the rail network of the Salmon River and Northern Railway lumber trains. The wood harvest was carried out by lumberjacks who worked as “jobbers” or sub-contractors for the Fassett Lumber Company. But loading the log cars and driving them down to Fassett was left to the company employees8. (image) Most of the wood: hardwoods such as birch, maple, oak, beech, basswood, elm, ash; and butternut as well as resinous species such as pine, spruce, hemlock and balsam fir, are reserved for the Haskell Lumber Company (and from 1910 onwards, for the Fassett Lumber Company) for the manufacture of converted wood, pulp log “bolts”, shingles, hemlock bark, etc. Standard Chemical was authorized to cut over the land that had already been logged by the Fassett Lumber Company. It would cut down any hardwood that was left over, no matter the size. Deciduous trees like birch, maple, oak, beech and ironwood, amongst others fed the distillation process that the “Chemical” used to produce wood alcohol. In 1910, the Fassett sawmill was powered by a 600 volt electric generator that supplied the electricity needed to light the mills and the town, to run the sawmill equipment and to operate the shingle mill. As for the pulp wood logs, they were laid out on tables that were fitted with circular saws. The saws were used to cross-cut the logs into four-foot lengths before being placed in rossing machines9 that removed the bark. 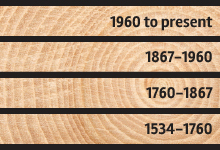 The rounded exterior of the saw logs, known as slabs, were sorted out, and the best ones passed through a lath machine. The remnants of the wood and waste products of the mill were fed into a grinder and part of that ground wood mixture was used by the Fassett Lumber Company as fuel while the rest was transported by an overhead carrier, an endless chain with scoops going through a box-like trough. This conveyor belt carried off the mixture to the Standard Chemical plant where it was used to heat the retort ovens for the wood distillation process10. Year in and year out, a staff of about 75 workers worked the mills and piling grounds of the Fassett Lumber Company. 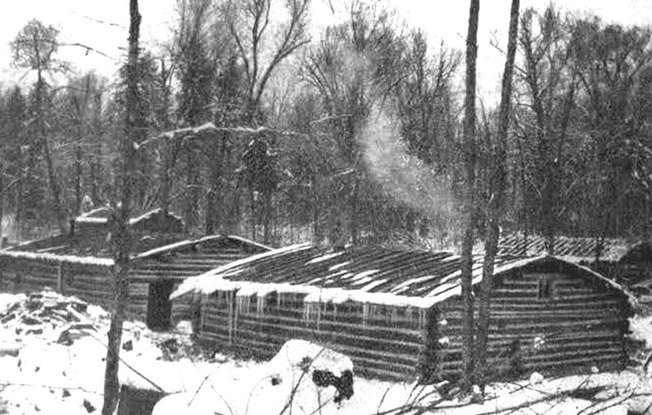 In order to supply the Fassett sawmill and factories, the wood harvest had to be intensive. In 1913, for instance, more than 250 lumberjacks, working out from the six main lumber camps, harvested the lumber in the Fassett Lumber Company limits. 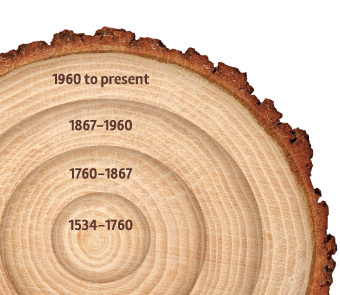 And in 1920, it was reported that the estimated life of the area for saw logs was from three to four years12. The timber limits were next to exhausted. The Fassett sawmill had to close down. Standard Chemical survived a bit longer but had to shut down anyway in 1937. The costs involved in the upkeep of the Salmon River and Northern Railway lumber train, which “the Chemical” had taken over, had become prohibitive. And the Seigneury Club, who had bought out the Fasset property, had no intention of renewing the contract that allowed Standard Chemical to cut hardwood on the old Fassett Company timber limits. Standard Chemical, the last surviving undertaking of Fassett’s Golden Age, finally disappeared in 1937, without leaving a single trace. In 1938, the railway tracks were lifted out and sold for scrap. In 1967, Fassett would get a second shot in the arm when a new lumber company, headed by Sylvio Brunet, will build a sawmill that will grow with the town for close to thirty-five years. Bois Francs DV, the company that took over from where Sylvio Brunet et Fils left off is a light at the end of the tunnel for Fassett’s population. 1 « Bull » refers to periods of growth and prosperity on the stock markets. 2 « Bear » refers to downward trends on the stock markets. 3 Fasset: In 1906, a post-office is built close to the new Haskell sawmill. The Post Office Department gives the name of Fassett to the new post-office in honour of the President of the company. 4 Distillation of wood alcohol: Distillation is the process through which liquid chemicals contained in solid substances like wood are separated. By using a process known as the destructive distillation of wood, substances such as creosote (a colourless oily fluid distilled from wood-tar), methyl or wood alcohol and many other chemical substances can be extracted from wood. 5 “One of Quebec’s Flourishing Companies”, in Canada Lumberman and Woodworker, December 15th 1910, page 28 and “Logging by Railroad in Quebec Limits”, in Canada Lumberman and Woodworker, January 15th 1913, page 36. 7 “How Fassett Company Gets Out Its Timber”, in Canada Lumberman and Woodworker, September 1st 1920, page 130. 8 “Logging by Railroad in Quebec Limits”, in Canada Lumberman and Woodworker, January 15th 1913, page 36 and “How Fassett Company Gets Out Its Timber”, in Canada Lumberman and Woodworker, September 1st 1920, pages 131, “Conditions of Logging Contracts”. 9 A rossing machine is a wash-tub like metal reservoir that revolves and through which flows a continuous stream of running water. The interior cutting surfaces remove the bark from the pulp bolts. 10 “How Fassett Company Gets Out Its Timber”, in Canada Lumberman and Woodworker, September 1st 1920, page 130. 11 “How Fassett Company Gets Out Its Timber”, in Canada Lumberman and Woodworker, September 1st 1920, page 130. 12 “How Fassett Company Gets Out Its Timber”, in Canada Lumberman and Woodworker, September 1st 1920, page 130. Source: “One of Quebec’s Flourishing Companies”, in Canada Lumberman and Woodworker, December 15th 1910, page 28. Photographer unknown. Caption: J. Sloat Fassett (1853-1924), President of the Haskell Lumber Company and after 1910 of the Fassett Lumber Company. 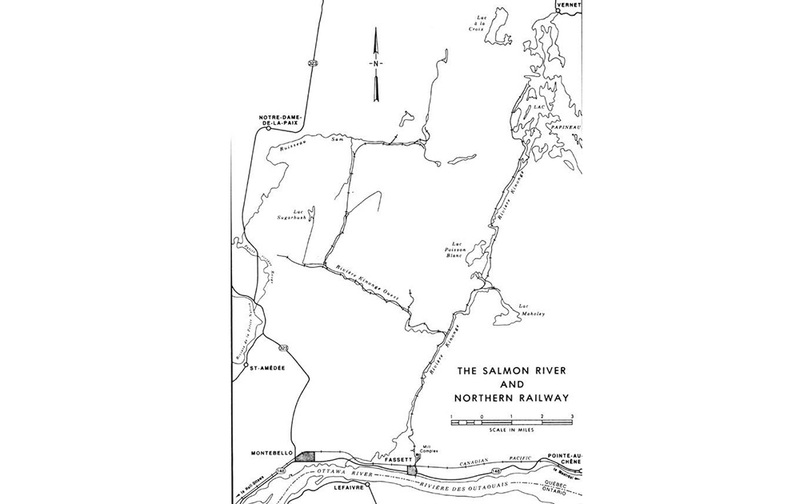 Caption: Map of the rail line lay-out of the Salmon River and Northern Railway. 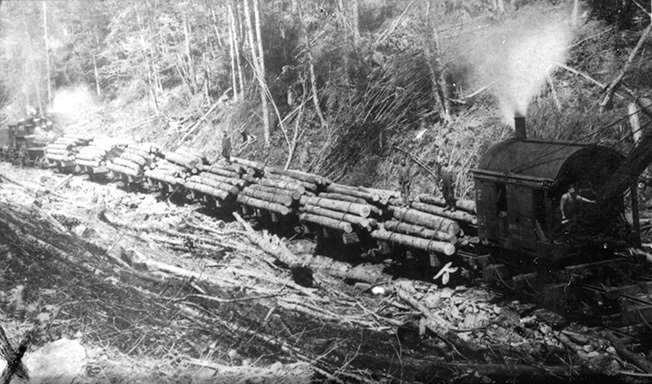 Caption: Photograph of one of the steam engines and of one of the steam loaders putting logs in a logging car. 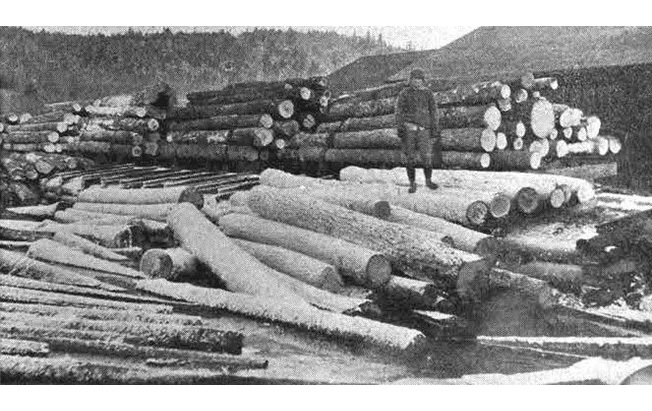 Source: “Logging by Railroad in Quebec Limits ,” in Canada Lumberman and Woodworker, January 15th 1913, page 36. Photographer unknown. Caption: One of the lumber shanties of the Fassett Lumber Company around 1913. Source: Logging by Railroad in Quebec Limits, in Canada Lumberman and Woodworker, January 15th 1913, page 36. Photographer unknown. 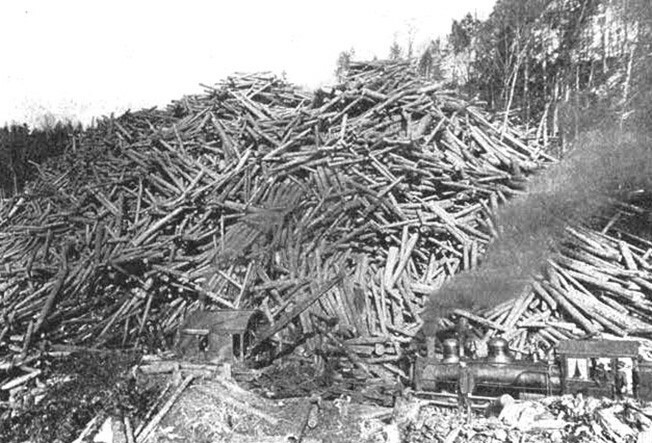 Caption: A skid containing about four million feet of logs on the Fassett Lumber Company limits around 1912. 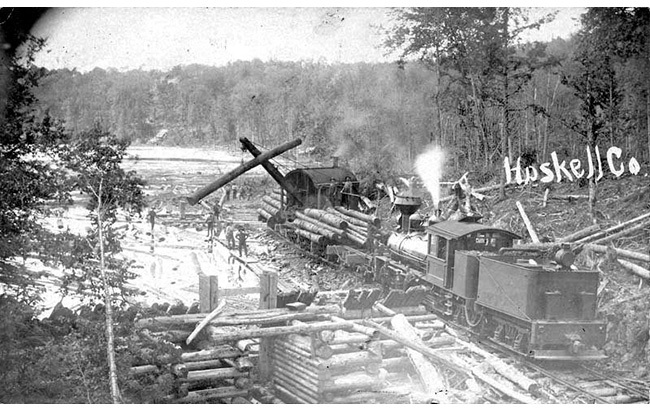 Caption: Steam loader and eight logging cars filled with logs and almost ready to go back down to Fassett. Source: “One of Quebec’s Flourishing Companies,” in Canada Lumberman and Woodworker, December 15th 1910, page 29. Photographer unknown. Caption: On arriving in Fassett, the logging train is parked alongside the mill’s heated log pond. An inclined rollway built on one side of the pond and parallel to the railroad is used to dump the logs in the pond. Source: “How Fassett Company Gets Out Its Timber,” in Canada Lumberman and Woodworker, September 1st 1920, page 129. Photographer unknown. Caption: This photograph offers more precision. The inclined rollway and the sloping railroad tracks make rolling the logs easier. One of the workers is standing on top of a pile of logs that has just slid into the pond. Source: “One of Quebec’s Flourishing Companies,” in Canada Lumberman and Woodworker, December 15th 1910, page 28. Photographer unknown. Caption: Office of the Fassett Lumber Company, in Fassett, around 1909. Caption: The Fassett Company sawmill. In the background can be seen the mill’s burner, the diameter of which varies from six to nine feet. It is covered with a steel wire-netting grid to prevent the escape of burning cinders. This is where the sawdust and wood residues of the sawmill would normally be burnt. But the burner is not in use after 1913. Thereafter, every bit of wood is salvaged. In Fassett, all the wood scraps are fed into a “hog” grinder. 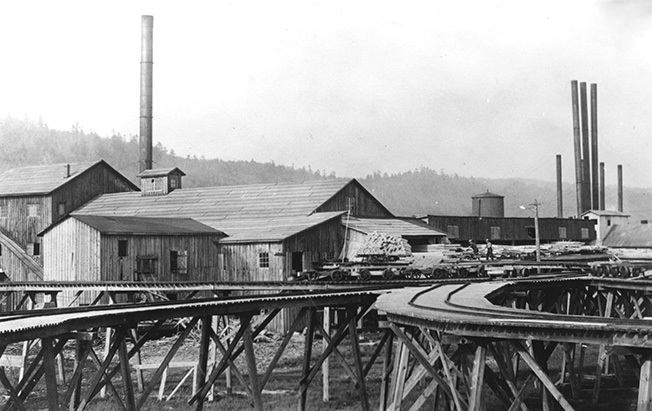 The resulting ground wood is used as fuel by the company as fuel to heat the mill and the log pond and by the Standard Chemical Company to fire its retort ovens. In the foreground is the mill’s heated log pond. Caption: The plant of the Fassett Lumber includes an elaborate system of rails and switches for the elevated tramways that honey-comb the lumber yard, the piling capacity of which is approximately 15 000 000 feet board measure. The saw-wood is hauled by these tramways throughout the piling grounds on the network of ground or over-head rails. Caption: Cross-roads of the elevated rails system used to haul the saw-wood to the Fassett Lumber Company lumber yards around 1910. This photograph is almost identical to the preceding one. A few differences can be seen however: The snow, the positioning of the tram-wagons, the kind of loads being hauled and the workers prove that the photograph was taken at another time. Caption: The Fassett Lumber Company piling grounds, showing the elevated tramways around 1910. Source: “Colin Churcher’s Railway Pages”. History of the Salmon River and Northern Railway at : http://www.railways.incanada.net/Articles/Article1988_1.html Aerial photograph No. HAS523-52 of the Air photo library of the Department of Energy, Mines and Resources of Canada. 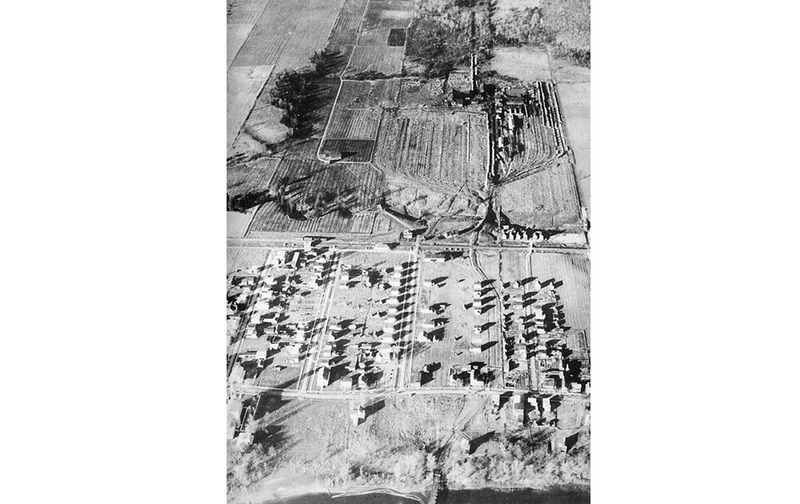 Caption: Aerial photograph taken on October 30th 1927. The old Fassett Lumber Company’s lumber yard can be seen. The railway sidings that used to serve the piling grounds have been lifted.